As our analysts and researchers travel the world surveying businesses, they hear a lot about disruption—the ability of new often-technology-backed companies to disrupt the status quo. Yet, our experience and insight tell us that disruption stretches beyond the realm of technology alone. Stephen Dover, head of equities at Franklin Templeton Investments, gives three examples of disruptions outside the tech sector. In recent years, we’ve seen a number of developments that suggest investors should rethink what they thought they knew. Countless reports have focused on how new technologies, such as self-driving cars, will disrupt global industries. Yet, some disruptions outside the domain of technology get much less attention. We highlight three disruptions for investors to think about when it comes to markets, economics and politics. Asia is disrupting and breaking the dominance of the United States in terms of the global consumption pattern. In recent years, many Asian countries, especially densely populated ones, such as China, India and Indonesia, have seen a surge in domestic consumption. 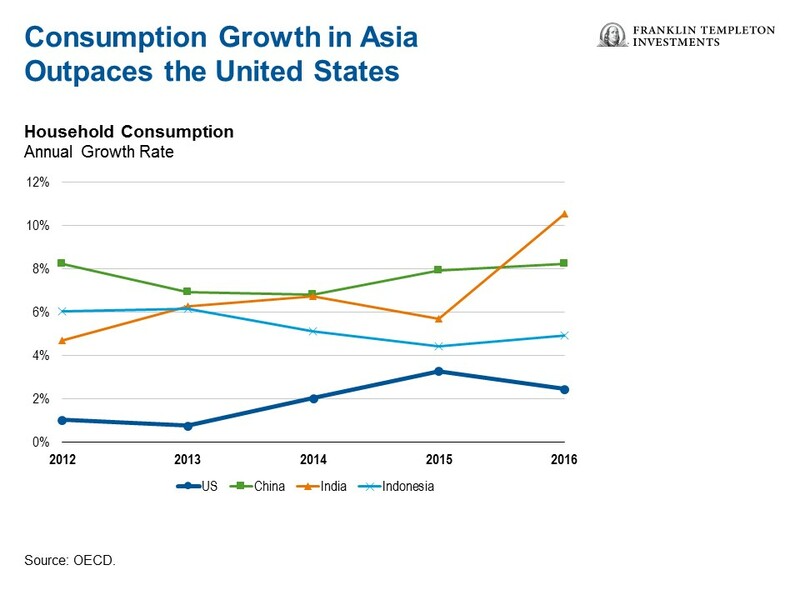 As the chart below shows, consumption is growing faster in these countries than in the United States, and this is creating more balance in global consumption than we have seen in the past. Since the 2008 global financial crisis (GFC), global central banks around the world have pumped vast amounts of monetary stimulus into the global economy. Those of us who have studied economics thought that would lead to massive inflation across the globe. That hasn’t happened yet, though we are starting to see signs of rising inflation in a number of markets. One of the reasons could be the massive expansion in global population, which is keeping labour costs down. That said, we’ve seen a different sort of inflation—not reflected in the typical consumer price indices—stem from the global stimulus programme. We’re referring to asset price inflation, as much of the stimulatory money from central banks went into the stock markets, real-estate markets and other assets. That essentially created the wealth effect. People who held on to their assets after the GFC have done phenomenally well. 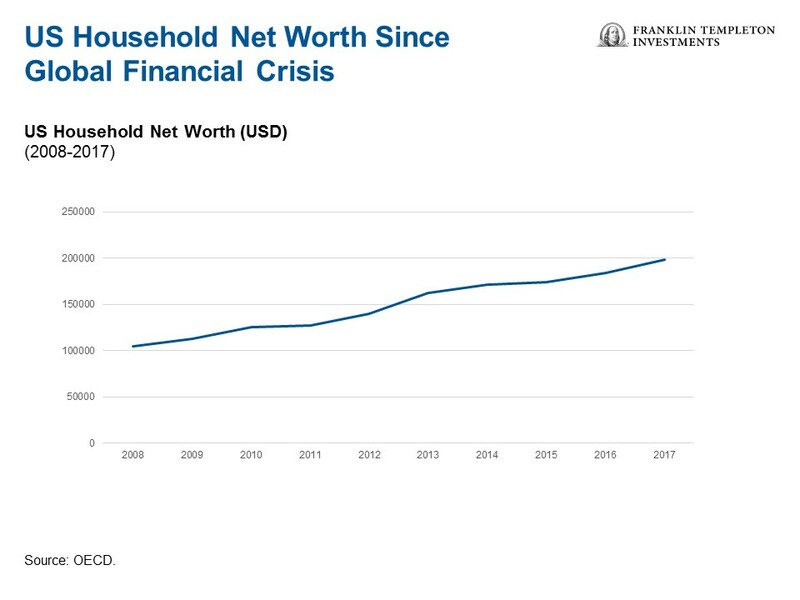 For example, in the United States, average household net worth nearly doubled from US$105,000 in 2008 to US$199,000 in 2017, as the chart below shows. In recent years, we’ve seen a growing populist movement in the United States and Europe. In our view, this is a reflection of a rise in individuality alongside widespread mistrust in existing civil societies. Many people feel they have been left out and are starting to question authorities. That may be partly to do with changing demographics. For example in the United States, the disaffected older generation seems to have been one of the key contingents whose votes fuelled the victory of Donald Trump. His supporters included many individuals who found themselves less well-off than in the past. There’s a similar story in Europe where the electoral success of populist parties has contributed to less certainty and more volatility. Coupled with rising levels of mistrust, we believe economic inertia in Europe and the United States has accelerated the rise in populism. In the past, the United States enjoyed an average 3% gross domestic product (GDP) growth rate over 10-year periods. 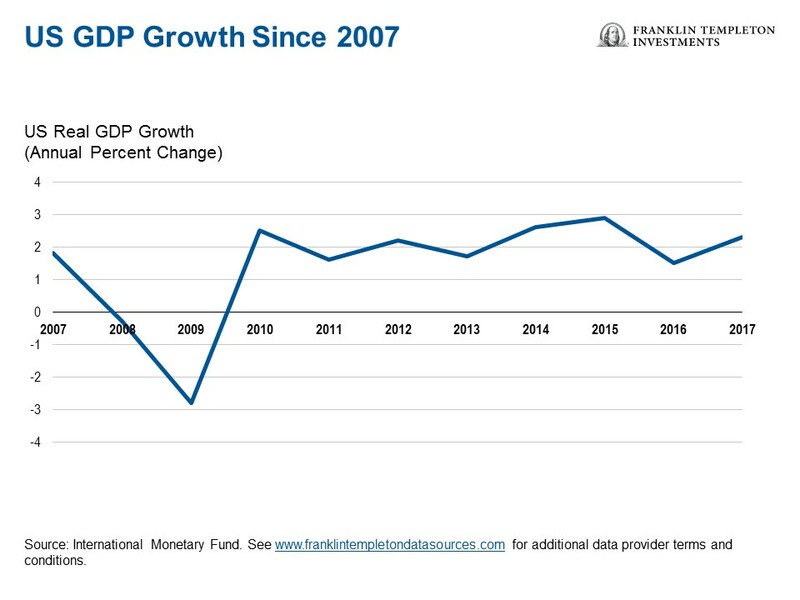 As the chart below shows, however, we haven’t seen that level of GDP growth in the United States over the past 10 years. All investments involve risks, including possible loss of principal. The value of investments can go down as well as up, and investors may not get back the full amount invested. Stock prices fluctuate, sometimes rapidly and dramatically, due to factors affecting individual companies, particular industries or sectors, or general market conditions. The technology industry can be significantly affected by obsolescence of existing technology, short product cycles, falling prices and profits, competition from new market entrants as well as general economic conditions. Special risks are associated with foreign investing, including currency fluctuations, economic instability and political developments. Investments in emerging markets involve heightened risks related to the same factors, in addition to those associated with these markets’ smaller size, lesser liquidity and lack of established legal, political, business and social frameworks to support securities markets.